From the 22nd to the 30th of October it was Dutch Design Week (DDW) in Eindhoven, a week wherein hundreds of new design projects are shown to the public. A lot of emergent projects can be found in Eindhoven during DDW, but one project was especially appealing to the press and the visitors of the design fair: an anti-surveillance coat. This coat makes credit cards unreadable and mobile phones untraceable. Project KOVR is the name of the anti-surveillance coat project. KOVR is pronounced as cover, and comes from Esperanto. The designers of this project are Marcha Schagen and Leon Baauw, they designed the coat to protect “you and your privacy against the threads of our information-driven environment” (projectkovr.com). There are multiple ways to protect online privacy: use a lot of different and complicated passwords, use the Tor Browser, use a VPN connection, block third-party cookies in your browser, obfuscation (TrackMeNot) et cetera. There are few options to protect your credit or debit card and mobile phone from getting hacked. There are metal cases that users can put their cards or phone in, so it is protected. The anti-surveillance coat is easier, as users can just throw their cards, phones or anything that can be attacked by ‘cybercrime’, in the pockets. By putting it in the coat’s pockets, users no longer have to be concerned with their personal online information being stolen outside. A mobile phone in the coat is not only untraceable, it is unreachable as well. The designers understood that users do not always want to be unreachable, that is why there is one pocket that is see-through. This see-through pocket at the front of the coat allows for signals to enter the coat, so users can receive phone calls or messages. This adding shows the designers have really thought about the needs and wishes of its potential customers. Cybercrime is a growing threat, people are more aware of this threat ever since Edward Snowden blew the whistle about how much online information is being collected about American citizens (Williams). Online privacy is a topic that has been on the radar for quite some time now. The worry of protecting ones online privacy is extending to the real world, with banking cards and mobile phones out in the open that can be hacked. More and more debit cards have an option to pay wireless, which is convenient as well as vulnerable for outside attacks. Furthermore, smartphones are also a vulnerable object containing a lot of personal information that can be hacked nowadays. The anti-surveillance coat claims to protect people’s online privacy even when they are out on streets, resulting in a solution for these problems that are becoming more significant. Although online privacy is considered to be very important, simultaneously people are sharing a lot about themselves on social media (Soffer 2). However, the kind of information that is shared on social media is not of the same importance as information that can be taken from banking cards or mobile phones. Users take a lot of effort to avoid their personal data being stolen (Cho 410). 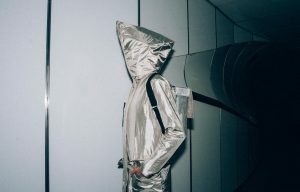 So if users are willing to undertake action to protect their personal information, they might also be willing to buy the anti-surveillance coat. This coat protects fairly obvious information from users. The online privacy matter reaches beyond the solution of Project KOVR. Companies such as Google and Facebook are considered as the main threads for online privacy. These companies ‘own’ so much information about their users, that they can sell to advertisers. The privacy problem online is in the fact that users can hardly prevent these large companies from collecting data about them, it is a battle between a giant and the midgets of asymmetrical proportions (Brunton). This privacy issue is not easily solved. The coat solves one little but important privacy matter, and that is the way to handle this situation. Step by step users can get more control over their own online personal data and how to protect this. Unfortunately the Kickstarter project has not been funded enough to actually get realized. It is astonishing that the project only has 34 backers, while there was so much attention from national and international press. Although it is an emergent and relevant design, potential users are scarce. Maybe the unisex design of the coat is not appealing to everyone. Hopefully Schagen and Baauw will find another way to make this project successful, because it is a very interesting and new way to look at the protection of digital privacy. It is a nice contribution to all the online solutions that have been given for the privacy issue. “Anti-Surveillance Coat: Protects you and your privacy by Project KOVR.” Kickstarter. 2016. Kickstarter. 11 November 2016. <https://www.kickstarter.com/projects/872955472/anti-surveillance-coat-protects-you-and-your-priva/description>. Brunton, Finn, and Helen Nissenbaum. Obfuscation: A User’s Guide for Privacy and Protest. Mit Press, 2015. Cho, Hichang, Milagros Rivera-Sánchez, and Sun Sun Lim. “A multinational study on online privacy: global concerns and local responses.” New media & society 11.3 (2009): 395-416. Project KOVR. 2016. Marcha Schagen and Leon Baauw. Project KOVR. 11 November 2016. <http://www.projectkovr.com/>. Soffer, Tal, and Anat Cohen. “Privacy Perception of Adolescents in a Digital World.” Bulletin of Science, Technology & Society (2015): 1-14. Williams, Oscar. “This Anti-Surveillance Coat Is A Fashionable Faraday Cage.” Huffpost Tech United Kingdom. 4 November 2016. The Huffington Post. 11 November 2016. <http://www.huffingtonpost.co.uk/entry/anti-surveillance-coat-fashionable-faraday-cage_uk_581c9d25e4b020461a1c5256>.